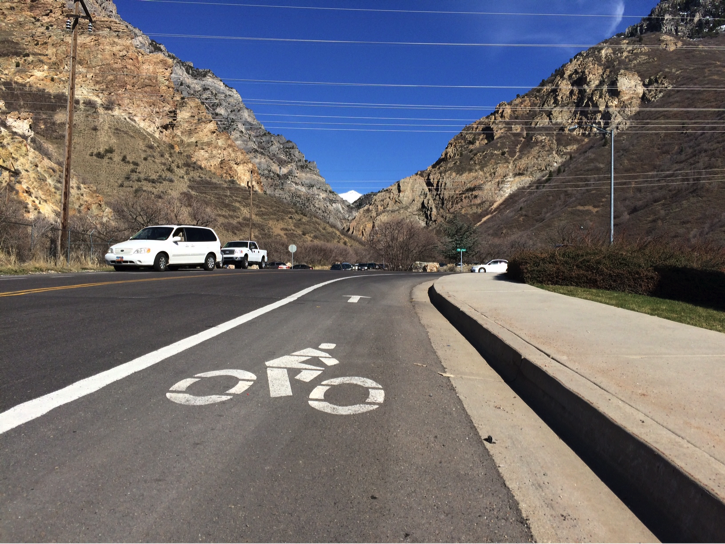 The Provo Bicycle Committee has applied to renew Provo’s status as a Bicycle-Friendly City. Now, the League of American Cyclists wants to hear from YOU! Please take 3 minutes to complete this quick online survey. 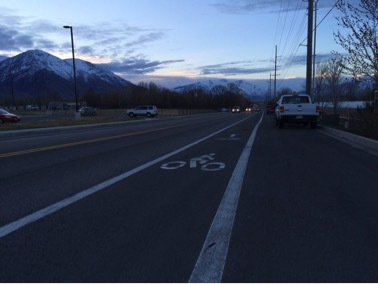 Your responses will help provide context as the League is making its award-level decision and will also provide data that will be used to make Provo even more bicycle friendly. Don’t forget to share the link with your Provo friends and neighbors. Even a quick action like this can make a difference; thanks for helping out! 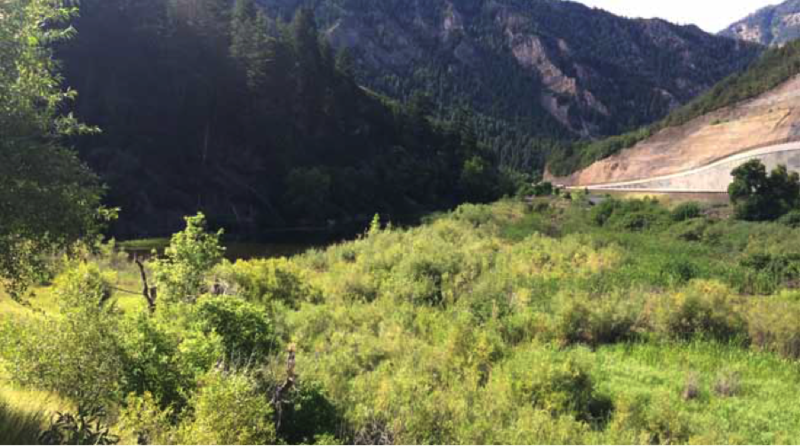 Imagine Riding the Provo River Trail to Deer Creek and Beyond: Imagine No Longer. This Will Soon be a Reality! 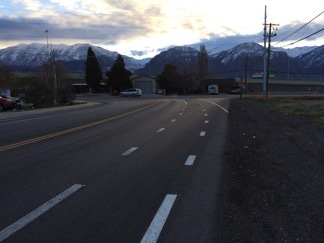 Besides funding for a pedestrian/bicycle bridge over the Union Pacific tracks at the Provo Frontrunner Station, the other major project related to Provo that the $20M Transportation Investment Generating Economic Recovery (TIGER) grant will help make possible is a 2.75 mile extension of Provo River Trail from Vivian Park to the Deer Creek Reservoir Trail. 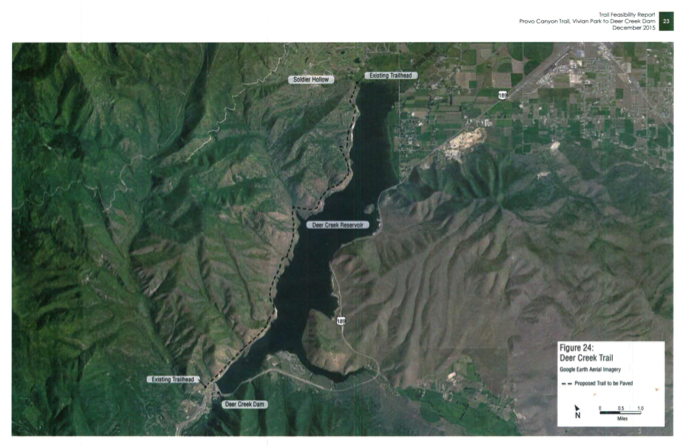 At the reservoir, the extension will connect to the Provo-Jordan River Parkway Trail that stretches around the west side of Deer Creek. Four million dollars (one-fifth of the total) of the grant is to be allocated to this project. 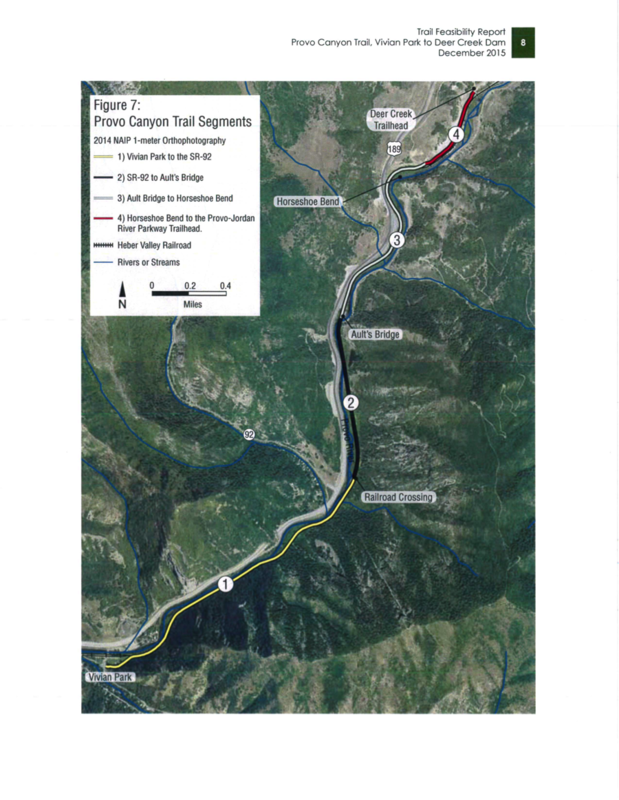 The estimated cost of the trail is $4.6M. The expected completion date has not yet been determined. This is what part of that area between Vivian Park and Deer Creek looks like now. 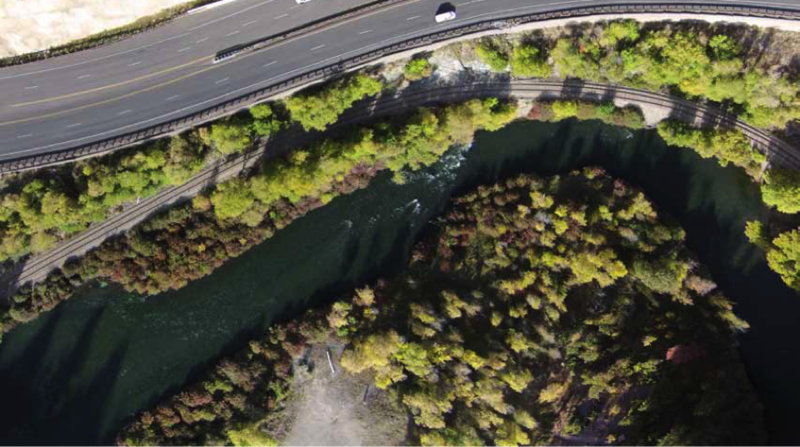 From above, you can see the road, the railroad track, and the Provo River. Some roadies brave riding on the shoulder of US-189, but for less risk-adverse, more casual recreational bicyclists (and pedestrians), there is no safe route up Provo Canyon after Vivian Park. This is what the area looks like from the ground. 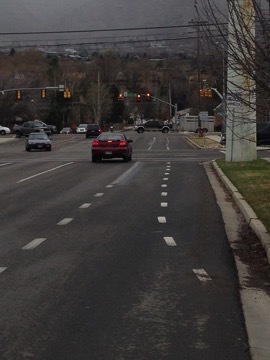 This is the view that most folks, including people on bicyclists, are most acquainted. It is the end the line. Here the immensely popular Provo River Trail, a 15-mile multi-use pathway starting at Utah Lake, dead ends at the start of the Heber Valley Historical Railway at Vivian Park. 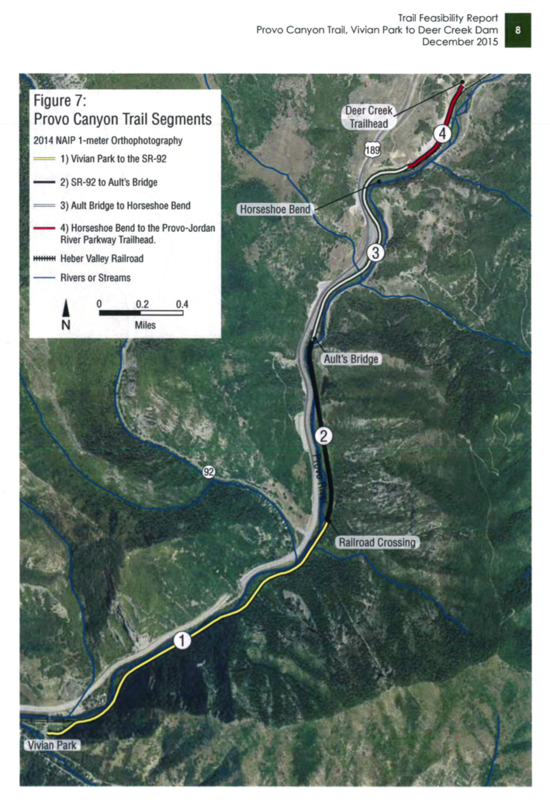 Here is a map of the new trail as it will extend from Vivian Park to Deer Creek along “Heber Creeper” railway line. This project is made possible thanks to railway company opening up its right-of-way for the trail. Here is an example of a rock and landscape separation between a trail and railroad. 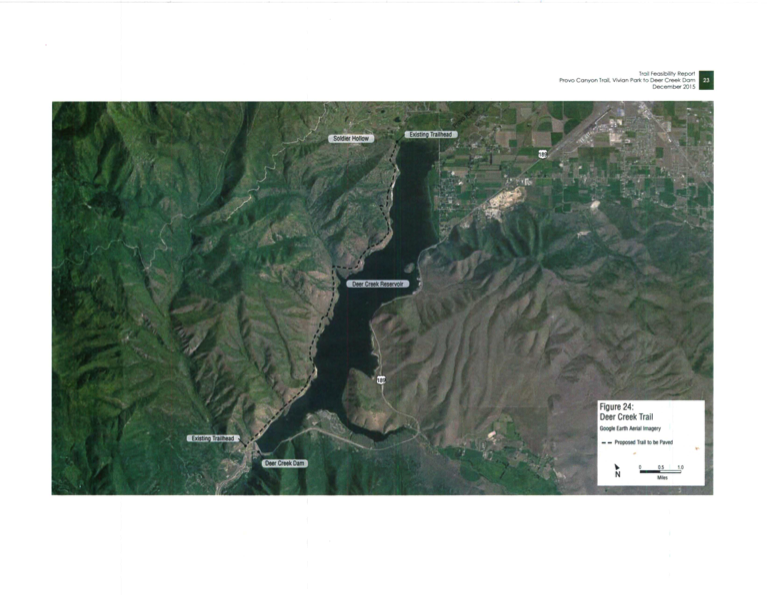 And once you get to Deer Creek, bicyclists will be able to continue around the west side of the reservoir to Stringtown Road in Heber City, not far from Soldier Hollow. Happy riding ahead! Please keep watching bikeprovo.org for updates as this project moves forward. 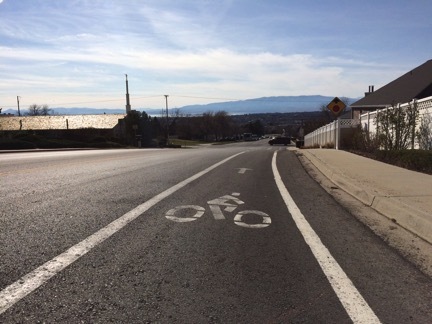 Provo Bicycle Committee Chair, Aaron Skabelund, recently submitted the Bicycle-Friendly Community application to the League of American Bicyclists. A BIG THANKS to the dozens of folks in the Committee who helped prepare the application during and outside of our monthly meetings since the beginning of the year, and a BIGGER THANKS to them and others for all you have done over the last several years to actually make Provo more bicycle-friendly. Four years ago, the league recognized Provo as a bronze-status Bicycle-Friendly Community. This month was the deadline to renew that status and request to move up in rank. We are of course aiming for a gold but what really matters is how the application process actually helps us make Provo a more bicycle-friendly community. 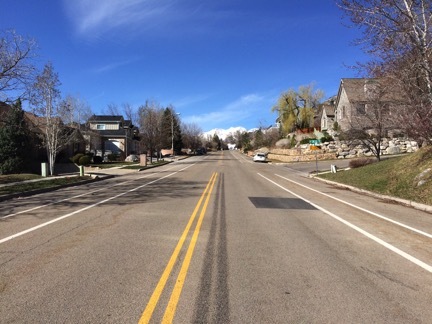 We certainly have made a lot of progress over the last four years thanks to everyone’s efforts and the forward-looking leadership of Mayor John Curtis, the city council, and city engineering, planning, parks and rec, police, and economic development officials who have worked closely with the Committee (and the Collective) to improve Provo’s quality of life for everyone. We look forward to applying again in several years when a number of transformative projects, such as the Bulldog Blvd protected bike lanes, the 200 East Neighborhood Greenway, and BRT, are complete. Another purpose of the application is to learn what we can do better. The league will provide provide Provo with detailed feedback when they notify of us their decision. – As called for the Bicycle Master Plan, the creation of a Bicycle (and Pedestrian) Coordinator position within the city. In short, we have made a lot of progress and have a lot to do. If you would like to join us making Provo an even better place, please join us! You can sign up for newsletters on the right-hand column of this webpage. 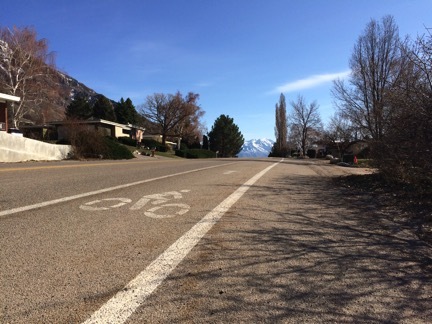 Every summer and fall, when Provo City Public Works performs work on roads, city engineers seek to implement recommendations for bicycle lanes called for by the Bicycle Master Plan, adopted by the city council in 2014. Although the bicycling community would like change to happen even faster and more dramatically, we are thankful to Engineering for the progress that the city is making in creating a truly integrated network of lanes and trails that residents can use for both bicycling—both recreation and utilitarian (riding to school, work, and to run errands). – Lanes on Indian Hills Drive/2780 North. – Lanes on 900 West between Center Street and 500 North (another really important stretch). 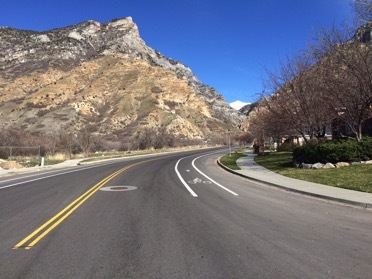 In addition, Matt Parker, UDOT’s Region Three’s bicycle coordinator announced at the meeting that UDOT would be installing bike lanes on University Avenue from near the mouth of Provo Canyon all the way down to 700 North this fall. The extension of the lanes on 3700 North to the intersection at University Avenue (where Will’s Pit Stop is). A reconfiguration of the bike lanes (through the elimination of the center median and restoration of on-street parking) on Independence Avenue from Center Street to 820 West. 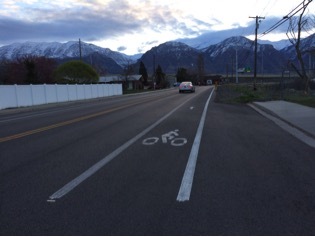 Again, a huge thank you to everyone in Provo who is working on making our streets safer for all road users. 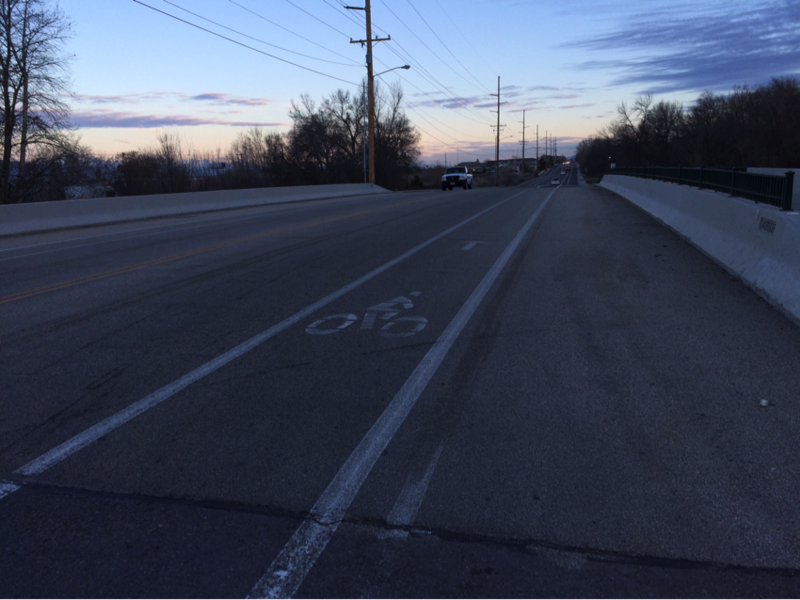 Get out and ride the new lanes (and check out the roads where we’ll be seeing even more lanes soon). Happy dance time. 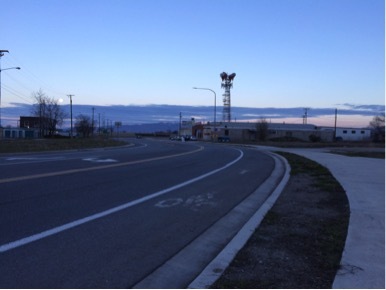 The much-needed ped / bike overpass to the Frontrunner station has received funding! As explained by Mayor Curtis, the overpass was selected for funding as a part of the competitive TIGER grant process. 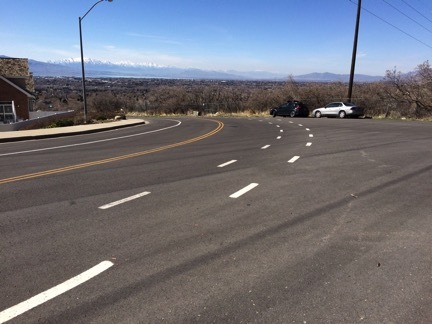 More than 30 communities worked together with regional transportation planning offices, UDOT, UTA local leaders to be chosen out of 585 other applications. 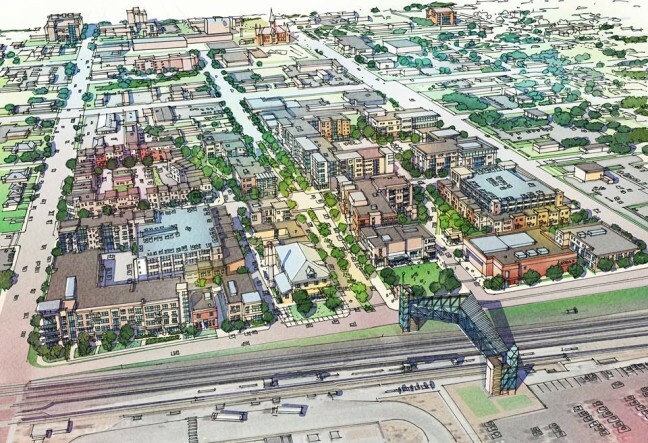 The exact plans aren’t finalized, but take a look at this awesome rendering of a Provo ped / bike bridge from the imaginations of Urban Design Associates working with the Giv Group. 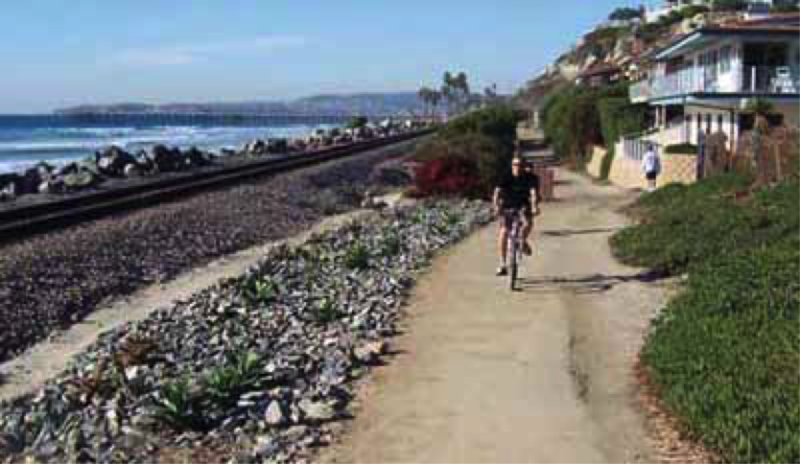 No more climbing between freight trains to get to the Frontrunner station (dangerous!) or missing your commute. You guys showed up at UTA community meetings, talked to MAG reps at bicycle committee meetings, and sent a clear message with survey responses and emails. Thanks for speaking up, everyone! 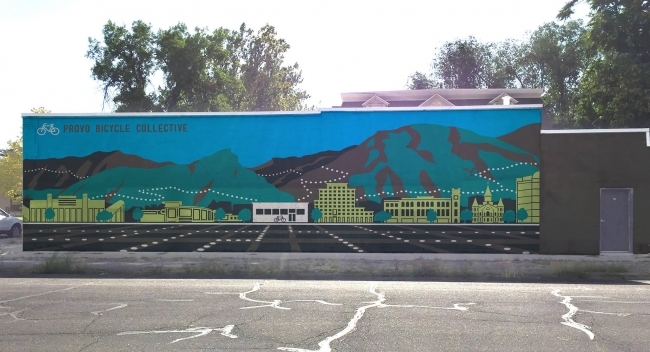 After dozens of incredible submissions, the Provo Bicycle Collective has chosen a design to be painted on the side of their new building. Check out this standout design by George Patterson. Congrats to George! Love how the design highlights all of the local lanes and mountainous trails. Can’t wait to see it on the building – it’s being prepped every time I ride by. There were tons of other inspiring submissions as well. Perhaps we can work to see some of these on other buildings throughout the city?